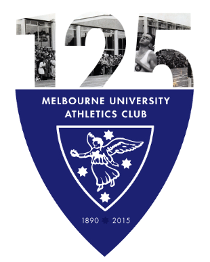 A deluge of high quality track and field has swept over Melbourne at the start of March and Melbourne University Athletics Club has been a big part of it. Jarrod Pageot continued his good long jump form with a 7.07m jump at the High Velocity Club 3 meet at Box Hill and followed it up with a massive 7.27m PB at Olympic Park for the Victorian Youth Track and Field Championships. There were some fine pole vault results at the Youth Championships as well, with MUAC sweeping the medals in the U17 girls; Genevieve Morris, Marianna Velo and Marianna Gilberto taking all the spots on the podium. Jessie Layman claimed silver in the U16 girls with a 2.80m vault and Jack Ingram took silver in the U17 boys, clearing 3.80m. Melbourne University Athletics Club had a strong showing at the Open Track and Field Relay Championships with several teams scoring medals. The women’s 4 x 100m team of Lisa Wolski, Lauren Jauncey, Jacquie Sharples and Emma Zalcman claimed bronze in a very tight race. Jauncey, Sharples and Zalcman then combined with Kath Clarke to win another bronze in the 4 x 400m relay. Zalcman and Jauncey continued their winning ways in the 4 x 200m relay to win a silver with Lisa Wolski and Kath Clarke. Linda Allen, current Australian triple jump champion and MUAC member, took out the Sydney Track Classic triple jump with a 13.30m performance, only 5cm off the B qualifying standard for the Commonwealth Games. MUAC stalwart Sophie Barker took the big stage with a start in the 1500m at the Melbourne Track Classic, Australia’s most prestigious annual athletic event. In a hot field with national champions and record holders, Sophie recorded a time of 4:46 and will be a strong contender for the steeplechase, her favoured event, at the state titles in a few weeks. MUAC had a strong showing at Rare Air Club 4 at Mentone, with Antony Hanna jumping 4.40m and Kath Iannello clearing 3.60m for third place. *Albert Einstein. One of the consequences of general relativity.